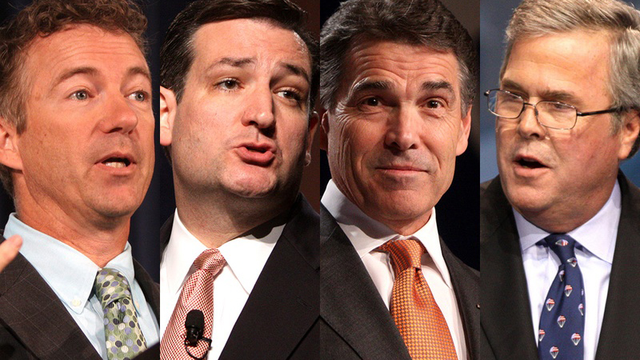 The Republicans could do to Texas in 2016 what the Democrats did in 2008 — bring an unsettled nomination for president to the state primary and driving thousands of extra voters to the polls. The Democratic battle between Barack Obama and Hillary Clinton drove turnout to a record high in that primary. Voters set a record on the Republican side, too, even though their fight was already over when it got to Texas. Another contest like that — not hard to imagine with well over a dozen candidates in the Republican hunt for the nomination — could have dramatic effects on who wins Republican primaries for congressional and legislative positions. Not everyone is so sure. “A lot of people who vote only once in a while might be just as conservative as the people who always show up,” said Eric Bearse, an Austin-based Republican consultant. A bigger electorate could be less informed on political issues. That could be an opening for a candidate with the ability to advertise. The mix of candidates could make a difference, too. Candidates with Texas ties, like Ted Cruz, Jeb Bush, Rick Perry and Rand Paul, could draw their own home crowds if their candidacies are still alive early next year. And candidates from different factions could attract different herds of support. This sort of turnout boom does not happen often in Texas. The parties tend to settle their presidential nomination battles in places like New Hampshire, South Carolina and Iowa. By the time they get to Texas, they’ve already all but chosen their nominees. Voters like a fight, and you can see the evidence of that in turnout. When there’s a big race, more people vote. That could affect candidates further down the ballot. Anti-establishment candidates have had notable success in GOP elections starting with the Tea Party spike in 2010. And while Republican Party turnout is much better than Democratic Party turnout in Texas, it remains anemic. A big election could change the voter mix in unexpected ways. “It’s just easier to calculate the general election than the primary,” Bearse says. In 2004, the Democrats had pretty much decided on U.S. Sen. John Kerry of Massachusetts by the time Texans voted. He got 67 percent here. U.S. Sen. John Edwards of North Carolina finished second with just 14.4 percent. In that primary, 6.8 percent of the state’s registered voters turned out, or 839,231 people. Four years later, the primary competition was still alive when Texans voted. The candidates traveled the state and campaigned here. They bought advertising. Voters got excited, as you can see in the turnout: 22.5 percent of the state’s registered voters came out — 2,874,986 people. Republicans got excited that year, in more ways than one. Even though their primary was pretty much decided in favor of U.S. Sen. John McCain of Arizona, Republican turnout swelled to 1.4 million in 2008 from 687,615 four years earlier. Democratic turnout was 3.4 times bigger in 2008 than in the previous presidential race, and Republican turnout doubled. Not all of those Democrats were Democrats. Republicans — some inspired by the chance to vote in a competitive race, some spurred by an “operation chaos” effort to pack Democratic primaries with conservatives — voted in the Democratic primary that year. Baselice, the pollster, estimates that nearly a quarter of the people who voted in that year’s Democratic primary in Texas supported Republicans at the top of the ballot — McCain for president and Texan John Cornyn for Senate — in that year’s general election. Four years later, with no presidential primary competition at the top of the 2012 primary ballot, Democratic turnout was back to its normal low level; 590,164 people turned out. The Republicans did better, with 1.5 million people voting in the second cycle of what is now recognized as the Tea Party wave. They also had a pretty interesting U.S. Senate race to attract their attention in 2012: That’s the primary that put Cruz and David Dewhurst into a runoff that marked the start of one political career and the decline of another. Maybe that could happen with a big turnout. Or maybe some Texas Democrats will do what their Republican counterparts did in 2008, sending a bunch of partisan voters into the other party’s primary. There is a cautionary ending to that story. The crossover Republicans, afraid of Clinton, were there for the Democrat they thought would make the easier foe in November. That guy has been president ever since.